Hair Loss in Women: When Should You Worry? Pinpointing a cause is the first step in combating hair loss in women. Find out more about why your hair may thin over time and steps you can take to help restore it. Most of us shed hair a little at a time — pretty much all the time. 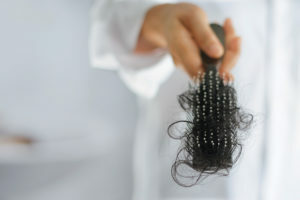 “Hair goes through cycles, where it grows and then falls out,” explains Ob/Gyn Lynn Simpson, MD. “So you should expect some shedding.” You can expect to lose between 50 and 150 hairs daily. The growth phase can last two to seven years. The transition phase lasts about two weeks. The resting phase lasts about three months, and ends in shedding. “If you feel like you’re losing an excessive amount of hair, talk to your doctor. You’ll need an evaluation,” she says. More than half of all women experience noticeable hair loss over time. Tight hairstyles. Tight ponytails, braids and cornrows can all cause hair loss and damage the follicles, which regulate hair growth. Changing hairstyles can help prevent thinning. But beware: When the follicles sustain too much damage, hair loss can be permanent. Extreme physical shock/stress. Dramatic changes in the body can cause temporary hair loss. Giving birth, rapid weight loss, surgery and certain illnesses may cause more hair loss than usual, typically in the resting phase. But hair should grow back over time. Medical therapies and toxic substances. Chemotherapy, certain other drugs and radiation treatments can prompt hair loss, mainly in the growth phase. Hair loss can strike suddenly, anywhere in the body. It is typically temporary (unless the follicles are damaged). Nutritional deficiencies. Not getting enough iron, protein or vitamin B12 in your diet can also cause your hair to thin. If this happens to you, talk to your doctor about supplements. Hormonal imbalances before, during and after menopause can lead to more permanent hair loss, Dr. Simpson says. Female pattern baldness is largely genetic, affecting hair along the top of a woman’s head. This typically begins when estrogen levels drop. A scalp injury that causes scarring can also cause permanent hair loss, she says. If your hair is thinning, your doctor may recommend taking biotin, iron or other supplements, or massaging 5 percent minoxidil (Rogaine®) into your scalp once daily, she says. Advanced treatments are available for more serious hair loss. Hair loss can be frustrating for women. But consult your doctor before you start to worry; thinning hair is often reversible, Dr. Simpson says. “Give your doctor a full hair history — when the thinning began, where and how extensive the thinning is, and any relevant symptoms,” she says.